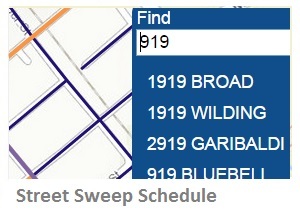 Click on the interactive map below to view details of the street sweeper schedule. Search by address location or zoom to an area to view a map of street sweep days. Check the sweeping map app link below to find your sweep day. Pile your cars up in the driveway on the morning your street will be swept. Keep a note on the refrigerator, in your car, or on your phone to help you remember. Typical sweeper hours in residential areas are 8:00 A.M. to 1:00 P.M. Routes scheduled on legal holidays will be skipped. Sweeping will resume on the next regularly-scheduled cycle for those areas. Call 781-7220 or email Street Supervisor for further street sweeping information. Street sweeping picks up not only large leaves and trash that you can see, but it also vacuums, collecting finer particles, including metals that come from cars. This benefits residents and the environment. Thank you for doing your part to keep the City clean! For problems with or comments about the map, please email our GIS Specialist.